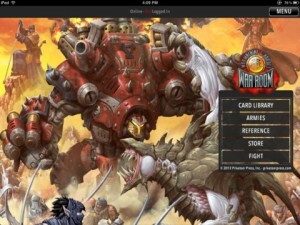 Game Classy put up some of their thoughts on Privateer Press' new app, War Room. As a proponent of the use of the digital medium in gaming, I was quite pleased when Steve, my co-host at “Game Classy”, told me of Privateer Press’ new app for smartphones and tablets. The War Room, as it’s dubbed by its creators, is a whole lot packed into a little bundle. It’s free no less, on both iOS and Android. After many push-backs and date changes, it has finally been released. Essentially a mobile deck protector with a fancy list builder attached, the War Room seeks to be an ingenious middle ground between lugging all your gaming materials around and being woefully unprepared for a pickup game.